During World War II the United States made extensive use of airplane photography using remodeled bombers. After the war, with the emergence of a hostile relationship with the Soviet Union, the United States began conducting photographic missions along the Soviet periphery. The aircraft cameras, however, could only capture images of territory within a few miles of the flight path. On some missions aircraft actually flew into Soviet airspace, but even those missions did not provide the necessary coverage of the vast Soviet interior. As a result, beginning in the early 1950s the United States began seriously exploring more advanced methods for obtaining images of targets throughout the Soviet Union. The result was the development, production, and employment of a variety of spacecraft and aircraft (particularly the U-2 and A-12/SR-71) that permitted the U.S. intelligence community to closely monitor developments in the Soviet Union and other nations through overhead imagery. The capabilities of spacecraft and aircraft have evolved from being limited to black-and-white visible-light photography to being able to produce images using different parts of the electromagnetic spectrum. As a result, imagery can often be obtained under circumstances (darkness, cloud cover) where standard visible-light photography is not feasible. In addition, employment of different portions of the electromagnetic spectrum, individually or simultaneously, expands the information that can be produced concerning a target. Such processing plays a crucial role in easing the burden on photogrammetrists and imagery interpreters. Photogrammetrists are responsible for determining the size and dimensions of objects from overhead photographs, using, along with other data, the shadows cast by the objects. 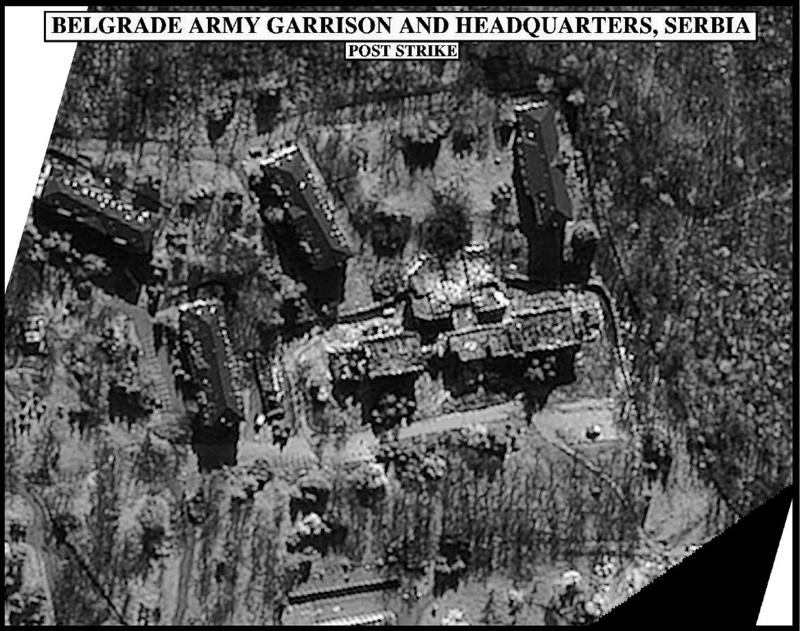 Photo interpreters are trained to provide information about the nature of the objects in the photographs--based on information as to what type of crates carry MiG-29s, for instance, or what an IRBM site or fiber optics factory looks like from 150 miles in space. Click on any of the following images to view a larger version of the photo. 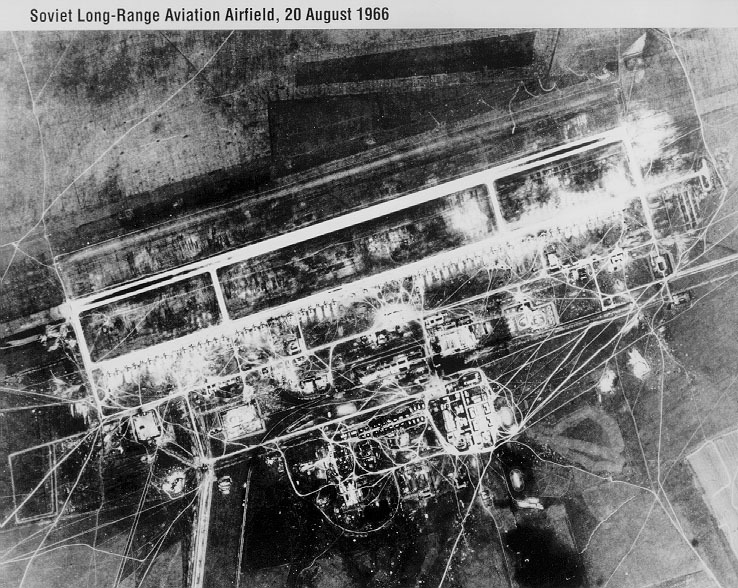 A KH-4A image of Dolon airfield, which was a major Soviet long-range aviation facility located in what is now the Republic of Kazakhstan. The image shows two regiments of Tupolev (Tu-16) Bear bombers. The main runway is 13,200 feet long. The KH-4A camera system was first introduced in August 1963. Resolution ranged from 9 to 25 feet. 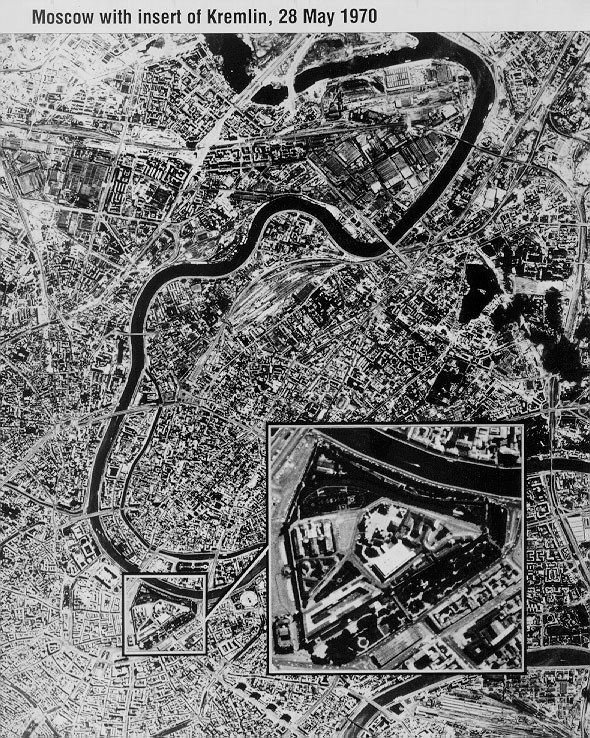 A KH-4B image of the Moscow, with an insert of the Kremlin. In the enlargement of the Kremlin, individual vehicles can be identified as trucks or cars, and the line of people waiting to enter Lenin's Tomb in Red Square can be seen. 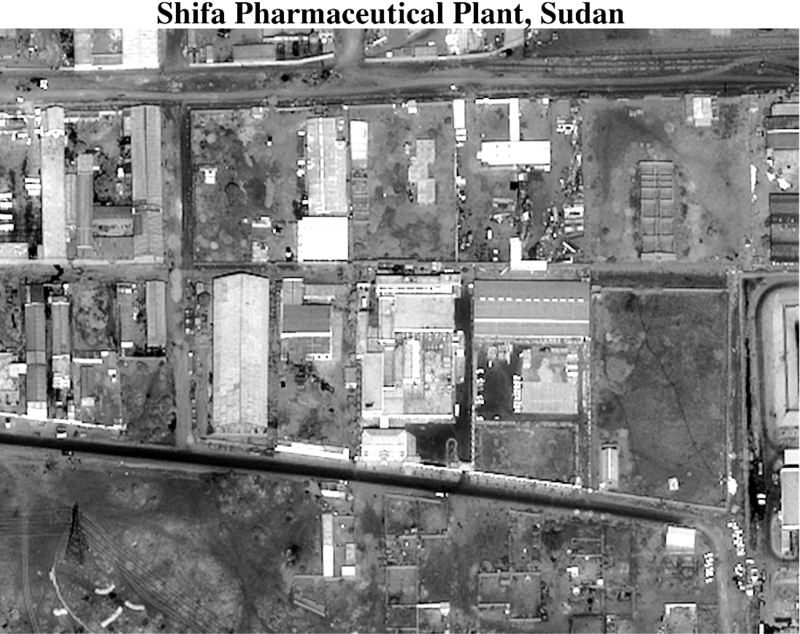 According to the CIA, the photograph "illustrates some of the best resolution imagery acquired by the KH-4B camera system." The KH-4B was first introduced in September 1967 and generally produced images with 6 foot resolution. 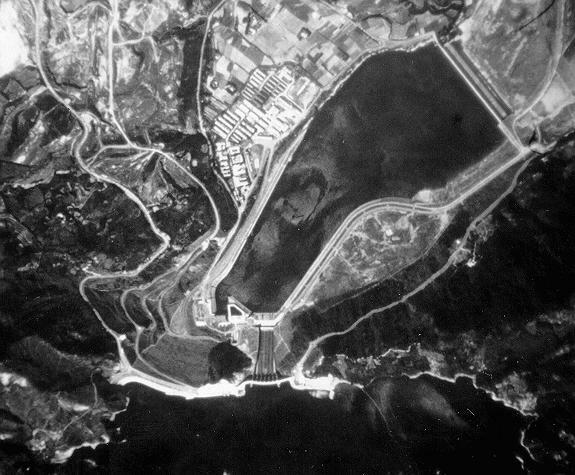 A KH-4B of image, taken on February 11, 1969 of a Taiwanese nuclear facility. The United States intelligence community, relying on CORONA and other forms of intelligence, has closely monitored the nuclear facilities of both adversaries such as the Soviet Union and the PRC and those of friendly nations such as Taiwan and Israel. The primary objective of the CORONA program was to provide "area surveillance" coverage of the Soviet Union, China and other parts of the world. Thus, CORONA yielded single photographs which covered thousands of square miles of territory - allowing analysts to both examine images of known targets and to search for previously undetected installations or activities that would be of interest to the U.S. intelligence community. 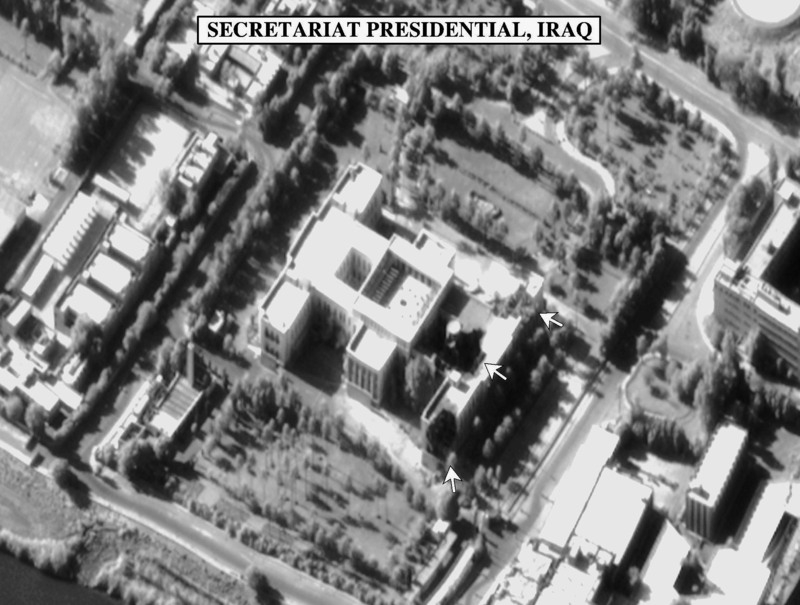 The 1980s saw a number of inadvertent or unauthorized disclosures of U.S. satellite imagery. 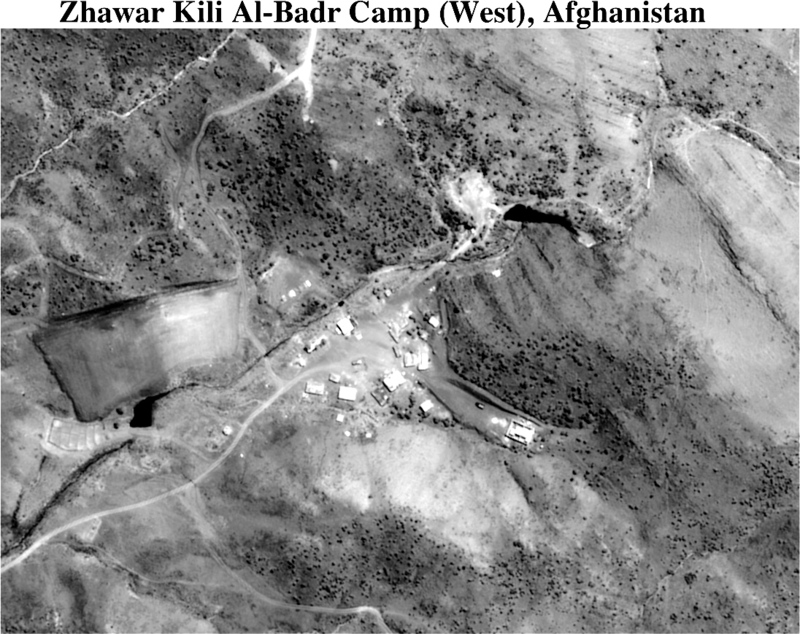 In 1980, as a result of the fiasco at Desert One, where U.S. forces landed in preparation for an attempt to rescue U.S. hostages held in Iran, KH-11 imagery of possible evacuation sites in Tehran was left behind. 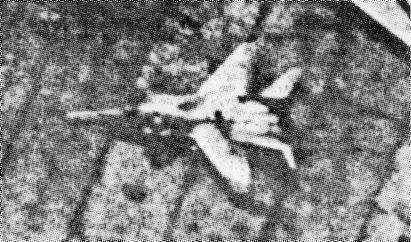 In 1981, Aviation Week & Space Technology published a leaked (and degraded) KH-11 photo of a Soviet bomber at Ramenskoye Airfield. 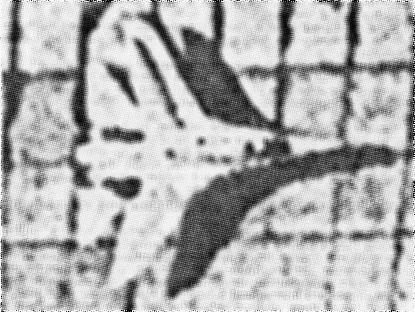 This 1984 computer enhanced KH-11 photo, taken at an oblique angle was leaked, along with two others, to Jane's Defence Weekly by naval intelligence analyst, Samuel Loring Morison. The image shows the general layout of the Nikolaiev 444 shipyard in the Black Sea. 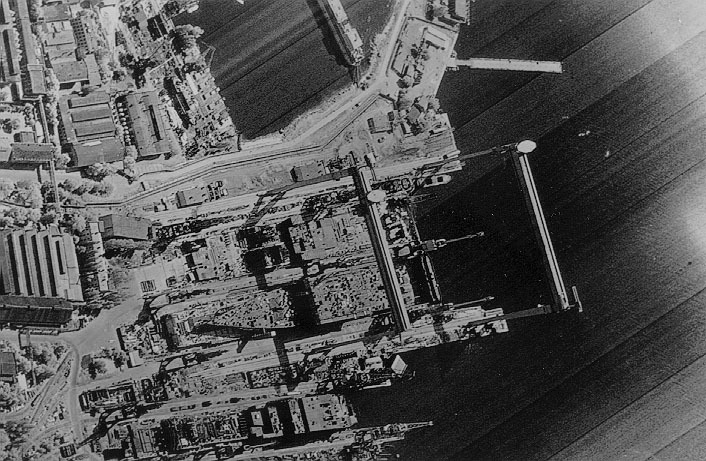 Under construction is a Kiev- class aircraft carrier (shown in the left side of the photo), then known as the Kharkov, along with an amphibious landing ship. Morison was brought to trial, convicted, and sent to prison in a controversial case. 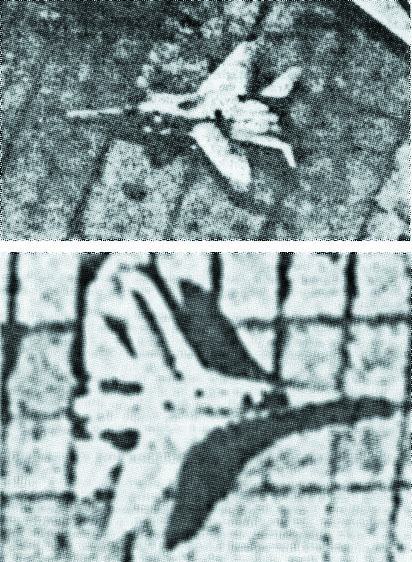 These satellite photographs, showing a MiG-29 FULCRUM and SU- 27 FLANKER, were shown to the House Appropriations Committee during 1984 budget hearings. They were then published, apparently by mistake, in the sanitized version of the hearings released to the public. 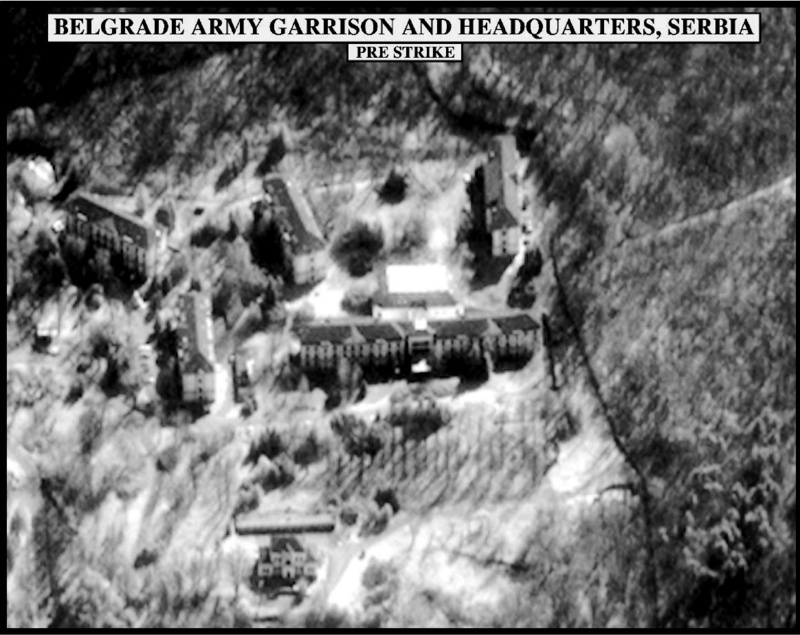 During the 1985 trial of Samuel Loring Morison, government prosecutors would acknowledge the photographs were satellite images, produced by a system other than the KH-11. 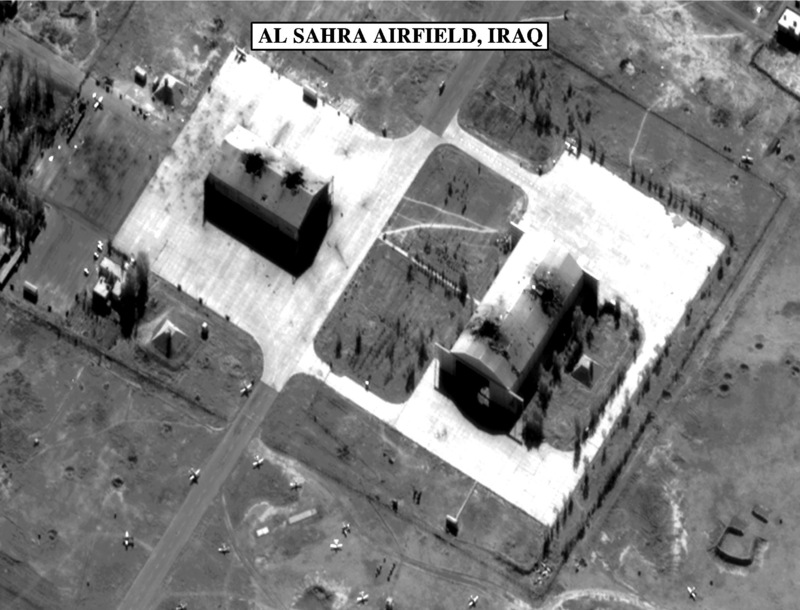 The United States is presently operating at least two satellite imaging systems. One is an advanced version of the KH-11, three of which have been launched, the first in 1992. LANDSATs 4 and 5 operate in 420 mile sun-synchronous orbits and each carries a Thematic Mapper (TM), an upgraded version of the Multispectral Scanner (MSS) on earlier LANDSATs. A typical LANDSAT images is 111 by 102 miles, providing significant broad area coverage. However, the resolution of the images is approximately 98 feet--making them useful for only the coarsest intelligence tasks. 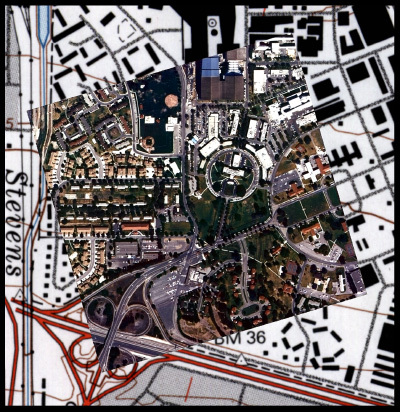 U.S. intelligence community use of commercial imagery will expand dramatically in the coming years if the new generation of commercial imaging satellites lives up to expectations--which include images with 1-meter resolution. 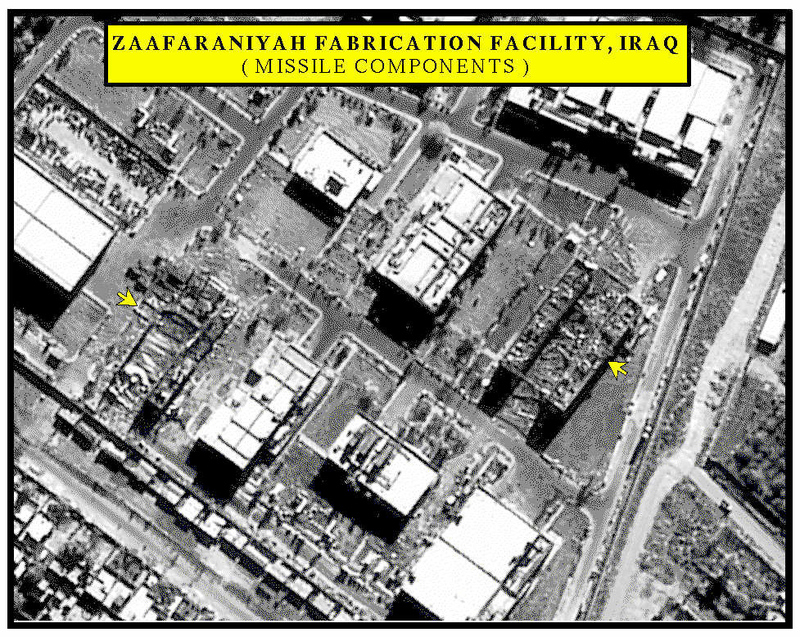 Such imagery and the reduced cost of attaining it when purchased commercially will permit the U.S. intelligence community to fill part of its needs via such commercial systems. An overhead photograph of Mountain View, California that that has been digitally scanned to represent the one-meter imagery that the Ikonos satellites are expected to provide. 1. William Burrows, Deep Black: Space Espionage and National Security (New York, N.Y.: Random House, 1986), pp. 28, 32. 2. Farouk el-Baz, "EO Imaging Will Replace Film in Reconnaissance," Defense Systems Review (October 1983): 48-52. 3. Richard D. Hudson Jr. and Jacqueline W. Hudson, "The Military Applications of Remote Sensing by Infrared," Proceedings of the IEEE 63, 1 (1975): 104-28. 4. Ibid. ; Bruce G. Blair and Garry D. Brewer, "Verifying SALT," in William Potter (ed. ), Verification and SALT: The Challenge of Strategic Deception (Boulder, Co.: Westview, 1980), pp. 7-48. 5. Homer Jensen, L.C. Graham, Leonard J. Porcello, and Emmet N. Leith, "Side-looking Airborne Radar," Scientific American, October 1977, pp. 84-95. 6. Paul Bennett, Strategic Surveillance (Cambridge, Ma. : Union of Concerned Scientists, 1979), p. 5. 7. Richard A. Scribner, Theodore J. Ralston, and William D. Mertz, The Verification Challenge: Problems and Promise of Strategic Nuclear Arms Verification (Boston: Birkhauser, 1985), p. 70; John F. Ebersole and James C. Wyant, "Real-Time Optical Subtraction of Photographic Imagery for Difference Detection," Applied Optics, 15, 4 (1976): 871-76. 8. Robert L. Perry, Origins of the USAF Space Program, 1945-1956 (Washington, D.C.: Air Force Systems Command, June 1962), p. 30. 10. On the impact of Sputnik, see Robert A. Divine, The Sputnik Challenge: Eisenhower's Response to the Soviet Satellite (New York: Oxford, 1993). 11. Jeffrey T. Richelson, America's Secret Eyes in Space: The U.S. KEYHOLE Spy Satellite Program (New York: Harper & Row, 1990), pp. 26-30. 12. Kenneth E. Greer, "Corona," Studies in Intelligence, Supplement, 17 (Spring 1973): 1-37, reprinted in Kevin C. Ruffner (ed. ), CORONA: America's First Satellite Program (Washington, D.C.: CIA, 1995). 15. McDonald, "CORONA: Success for Space Reconnaissance ...". 16. Robert A. McDonald, "Corona's Imagery: A Revolution in Intelligence and Buckets of Gold for National Security," in Robert A. McDonald (ed)., CORONA: Between the Sun and the Earth - The First NRO Reconnaissance Eye in Space (Baltimore: American Society of Photogrammetry and Remote Sensing, 1997), pp. 211-220; Greer, "CORONA"; Frank J. Madden, The CORONA Camera System, Itek's Contribution to World Stability (Lexington, Mass. : Itek, May 1997), p. 6. 17. Executive Order 12951, Release of Imagery Acquired by Space-Based National Intelligence Reconnaissance Systems, February 24, 1995. 18. Richelson, America's Secret Eyes in Space, pp. 77-78, 359-60. 19. Ibid., pp. 105-21, 361-62. 20. Ibid., pp. 123-143, 362. 21. Burrows, Deep Black, photo section. 22. Richelson, America's Secret Eyes in Space, p. 231; Craig Covault, "Advanced KH-11 Broadens U.S. Recon Capability," Aviation Week & Space Technology, January 6, 1997, pp. 24-25. 23. Bob Woodward, VEIL: The Secret Wars of the CIA, 1981-1987 (New York: Simon & Schuster, 1987), p. 221. 24. Jeffrey T. Richelson, The U.S. Intelligence Community 4th ed. (Boulder, Co.: Westview, 1999), p. 155. 27. Bob Preston, Plowshares and Power: The Military Use of Civil Space (Washington, D.C.: NDU Press, 1994), pp. 55-56; Richelson, The U.S. Intelligence Community, p. 159. 28. Richelson, The U.S. Intelligence Community, p. 159. 29. Joseph C. Anselmo, "Space Imaging Readies 1-Meter Satellite,"
Aviation Week & Space Technology, May 19, 1997, p. 26; "Ikonos 1 Undergoes Tests as Launch Nears," Space News, May 11-17, 1998, p. 19; "Commercial Developments," Aviation Week & Space Technology, June 29, 1998, p. 17. 30. Richelson, The U.S. Intelligence Community, pp. 160-61.